Hey everyone! My name is Nikki and I blog over at Domestically Modern. I’m kind of a newbie when it comes to the whole blogging thing, but I have totally loved it so far. I’ve always been crafty and now I have a brand new reason to be crafting up a storm whenever inspiration hits! Since the holidays are coming up I thought it would be nice to get into the spirit and share something I love to give away as a present, or have at all those holiday parties. 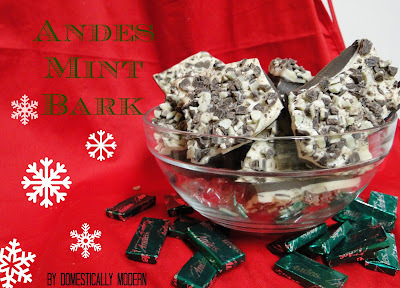 I’m going to be giving you a recipe for Andes Mint Bark. 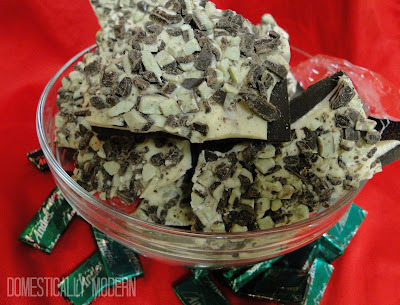 It’s a chocolatey delicious take on peppermint bark…and in my opinion (and my husbands!) can’t be beat! Melt semi-sweet chocolate in a microwave safe bowl, or double boiler (as long as you melt it, doesn’t matter how). Pour and spread chocolate into a 13×9 pan that is covered in parchment paper. Put this in fridge and wait until it is hardened. After the first layer is good and hard, melt the white chocolate in a microwaveable bowl. 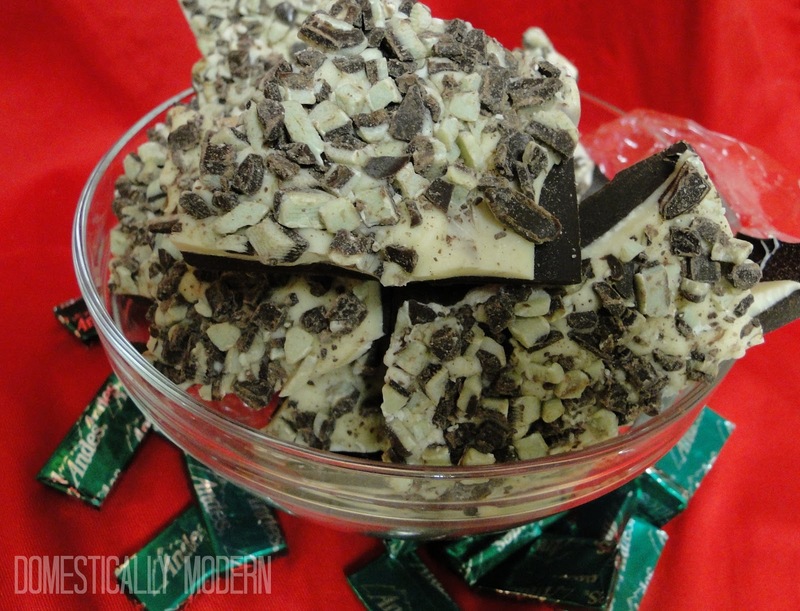 Splash some peppermint extract in the white chocolate and stir. However much or however little your peppermint loving heart desires! Pour this mixture over the dark chocolate. *Be careful when spreading this mix it will tend to make the darker chocolate mix with it if you push too hard! Place this in the refrigerator for about 3-4 minutes, not to get hard just to firm up a bit. 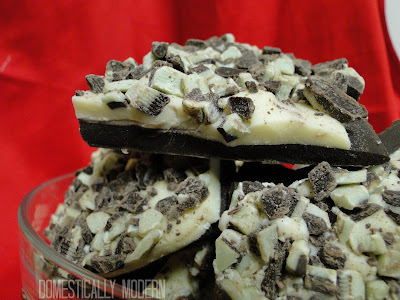 Once firmed pour Andes Mints onto the top layer and lightly press the pieces into the chocolate. Get out of fridge and have fun breaking up that bark! Now you are ready to put your bark in a cute mason jar or tin or something cute like that!! Look at how pretty that is…plus it looks impressive!So give it a try and give your friends, family, and guests a minty, chocolatey, homemade and easy gift for the holidays! Thanks for reading and make sure to stop by Domestically Modern sometime!